The Greater Tacoma Convention Center is one of Washington State's largest meeting and convention facilities. 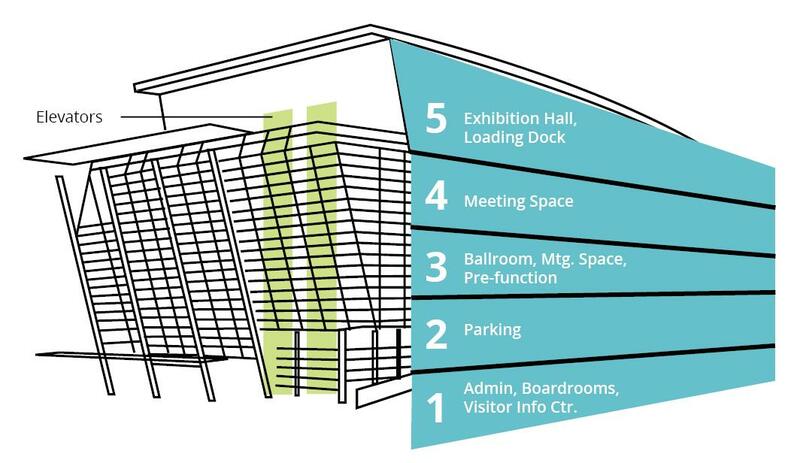 The carefully planned event spaces make the Convention Center one of the most user-friendly facilities in the industry. Each meeting and event space has been designed to take advantage of the open floor plan and flexibility. Located on the fifth floor, a 9,000 square foot glass enclosed pre-function space outside the Exhibition Hall greets guests with breathtaking water and mountain views. The column-free, 50,000 square foot Exhibition Hall can be used as one large space or divided into Hall A with 22,500 sq. ft. or Hall B with 27,500 sq. 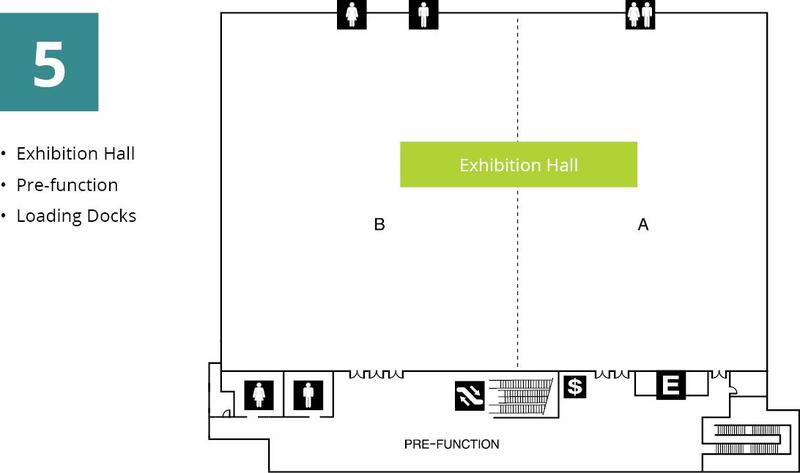 ft. Electrical/utilities can be accessed throughout the Exhibition Hall through strategically placed floor box locations. Located on the third floor, guests enter the Ballroom through an impressive glass framed 17,800 square foot pre-function space. The 13,400 sq. ft. ballroom is divisible and can be configured together or independently. 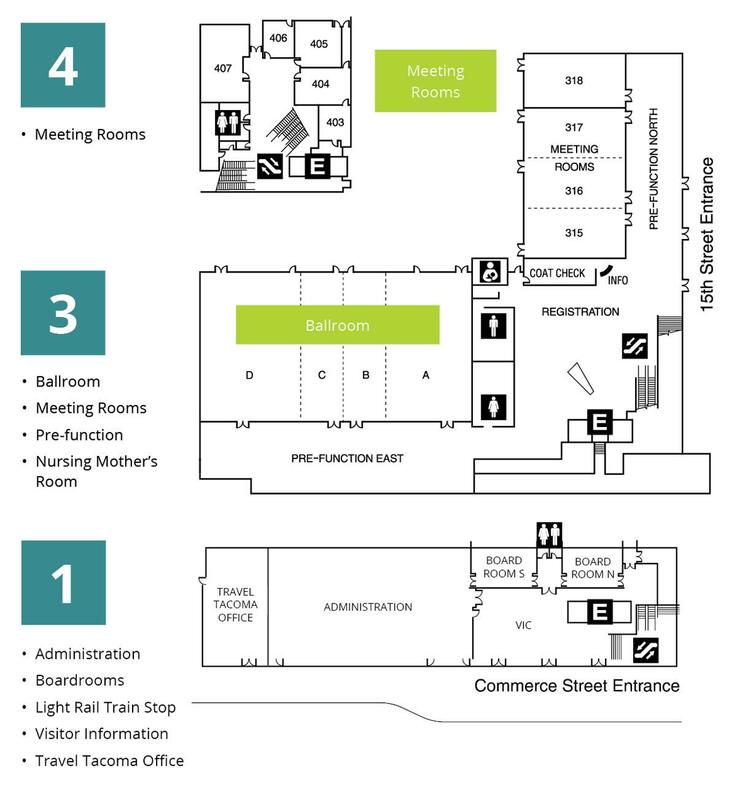 A Coat Check, VIP Room, and Information or Registration Desk are also located on the third floor. Electrical/utilities can be accessed throughout various floor box locations. 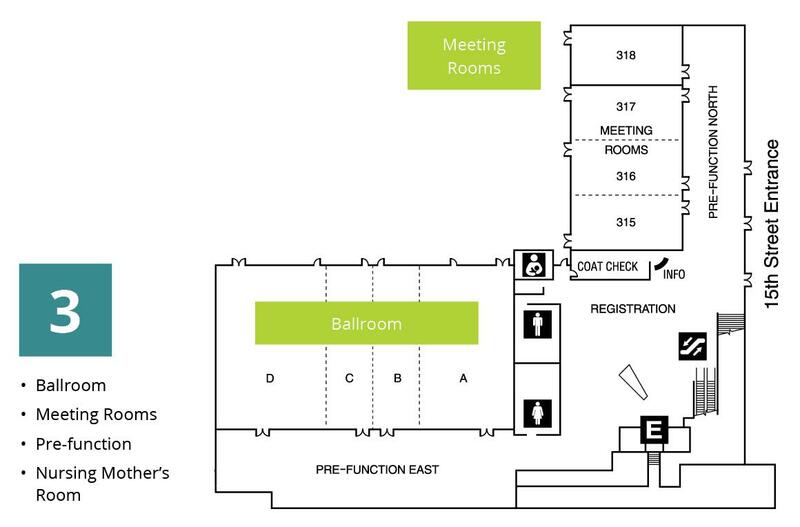 The Convention Center's flexible meeting space includes up to 14 separate breakouts meeting room configurations with a total of 24,000 square feet. The meeting rooms are located on both the third and fourth floors with two additional Executive Board Rooms and 1,831 sq. ft. of generous pre-function space available on all floors. Our sales and event staff will create a custom room layout/occupancy plan to best suit your event needs. The occupancies below are a guide. Please note that actual custom layouts and occupancies may decrease based on A/V, stage, food, and special event requirements. Contact us to create a custom layout for your event today.